Thank you for visiting the site of Dr. Soucheray’s At Home Veterinary Care! How can we help you and your pet? At Dr. Soucheray’s at Home Veterinary Care, we strive to provide a peaceful, compassionate, and high quality veterinary experience in your home. Reduces the risk of your pet coming into contact with a contagious disease. Less fear, stress and anxiety than going to a hospital. We are a personable and reliable veterinary team. Convenient. We bring the vet to you! More flexibility in your busy schedule, making it easy for you to be a great pet owner! Personalized attention for your pet based in their home environment. We provide compassionate, private euthanasia within the comfort of your home & pets surroundings, proven to be more comfortable and familiar for you and your pet. Dr. Soucheray is certified in Animal Hospice and Palliative care for pets with life-limiting illnesses or conditions. Wow! Dr. Soucheray and her assistant are so wonderful. Thank you so so much. I totally recommend her services! They were professional, compassionate, and flexible. Dr. Soucheray was our veterinarian during the final months of our 22-year-old cat's life. We deeply appreciated Dr. Soucheray's expertise in geriatric pet care. Her guidance helped us understand what to be concerned about in caring for an older pet, and perhaps more importantly, what not to worry about. In the end, we asked Dr. Soucheray to euthanize our beloved kitty. Saying goodbye was heartbreaking, but the euthanization itself couldn't have been handled more beautifully. Dr. Soucheray made one of life's most difficult days respectful and loving and peaceful. I couldn't recommend her more highly. Thank you Dr. Soucheray not only for being such a great vet but also for your comforting words and kindness. You made a sad experience as good as it possibly could be and we are forever grateful to you! I HIGHLY recommend Dr. Soucheray and her mobile vet service! Dr S was wonderful and caring. So thankful for her service and being there for end of life for my dog Pearl. She helped to take a lot of stress away from the process so I could focus on my beloved pet. Dr. Soucheray and her assistant Theresa are awesome!! So kind and knowledgeable. You can tell they truly care!! Highly recommend! Thank YOU! So happy to have found you! Thank you for everything today! You ladies did an amazing job! I couldn’t have asked for that to go any better at such a difficult time. Diesel was so comfortable and we can’t thank you enough! “Dr Soucheray, thank you and Theresa for your thoughtful condolence card. Diane and I have had many pets over our 48 years together and outlived all of them. We loved them all. We have never in all of this time received such a beautiful, heartfelt card from any veterinarian like the card we received. Diane, Maria and I thank you very much for the compassionate service that you provided to us…. Wow! We were featured by the University of Minnesota! Sandra Soucheray, ’02 DVM, can treat three dogs in just one hour. She has spent the last three years driving across the Twin Cities to take care of dogs and cats at home. 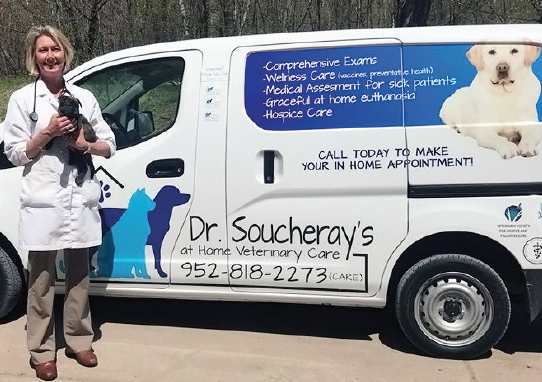 Soucheray worked in a clinic for 13 years before launching Dr. Soucheray’s At Home Veterinary Care, her own mobile practice. Now, she keeps all her equipment in her van and provides pet care in her clients’ homes. She has found that pets respond better to treatment in their natural environment—some don’t even have to leave their bed. “A lot of pets don’t like traveling in cars,” says Soucheray. And for many pets, hospitals and clinics can be overstimulating. Soucheray and her mobile team often end up offering their services to clients whose pets are long overdue for a vet appointment. Soucheray’s mobile service includes vaccinations, evaluations, blood work, treatments for many illnesses, and behavior and nutrition control. Being inside homes often gives Soucheray the opportunity to see how changing an animal’s environment can help with managing behavioral issues or illnesses such as osteoarthritis. The at-home approach also offers clients a more comfortable setting for end-of-life care. This year, Soucheray was one of 62 veterinarians around the world who were the first to be certified in hospice and palliative care by the International Association for Animal Hospice and Palliative Care. When Soucheray worked in a clinic, she tried to give families as much time and space as they needed during euthanasia procedures, but now she can offer families a more personal experience. Many families opt to have their pet sedated in their favorite place outside while saying goodbyes. Recently, Dr. Soucheray’s at Home Veterinary Care was featured in a local circulating newspaper. The article can be found online at Mobile vet makes pets feel at home- fur real! Molly the yellow Lab, of North Oaks, sat as still as she could while veterinarian Dr. Sandra Soucheray, of Shoreview, examined her ears. “It’s a little red in there,” Soucheray noted as Molly sat comfortably on the floor in her own home. Molly received a one-time ear infection treatment that is new to the market. “I call it the magic pill,” said her owner, Bruce Carlson, who has seen the treatment be successful before. Soucheray and her vet technician, Theresa Miniscalco, also gave Molly, Georgie and their brother Cooper the poodle vaccines and drew blood to check for heartworm. They also had a general checkup. Cooper, 13, is aging and has been experiencing anxiety, perhaps due to his vision being affected in dim light. There’s a treatment for that, Soucheray said. She didn’t recommend medication right away, but instead recommended a pheromone collar or thunder jacket. “It’s like a baby being swaddled,” Soucheray said, who has been seeing Cooper since he was a baby. She has cared for the Carlsons’ pets since she worked at a brick-and-mortar clinic. Carlson said having a mobile vet is much more convenient and saves time. “One hour, three dogs — try to do that and go to the vet and come home,” Carlson said as Soucheray and Miniscalco wrapped up their work. The veterinarian will even visit his pets at his office in the North Oaks strip mall if needed, he added. three years now. She worked in a clinic for 13 years before launching her own mobile practice, Dr. Soucheray’s At Home Veterinary Care. She keeps all her equipment in her van and provides care in the pet’s home. No exam table is needed; pets respond better to treatment in their natural environment — the floor or even their pet bed. She became familiar with mobile vet service while working for one in Minneapolis before she attended veterinarian school. She thought the service helped pets be more comfortable and after working as a veterinarian in both clinic and home settings, she can attest to it. “A lot of pets don’t like traveling in cars,” she noted. Hospitals and clinics also have odd smells, weird noises and pets have the potential to catch illnesses from sick animals. A cat belonging to one of her clients hadn’t been to a vet for years before seeing Soucheray because it was so difficult to take the animal to the clinic. The mobile vet and technician were able to easily relieve the cat of urinary issues caused by severe hair matting, Miniscalco said. They don’t judge if an animal hasn’t been to the vet — they are just there to offer help. Being inside homes also gives the duo opportunities to see how changing the animal’s environment could help it manage a behavioral issue or illness, such as osteoarthritis. Soucheray’s mobile service includes vaccines, evaluations, blood work, treatment for many illnesses, behavior and nutrition control, and hospice and palliative care. She refers clients to a nearby hospital she recommends for surgeries. Being a veterinarian requires not only animal skills and medical knowledge but people skills, too, since pets can’t tell vets about their symptoms. “It’s a little bit like being a pediatrician,” Soucheray noted. One of her specialties is in-home euthanasia. Working at a clinic, she always tried to give families as much time and space as they needed, but with her own mobile practice she is now able to offer families a more personal experience. For example, families can have their pet sedated in their favorite place outside while the family says goodbye. This year, Soucheray was among one of 62 veterinarians around the world who were the first to be certified in hospice and palliative care by the International Animal Association of Hospice and Palliative Care. The certification included courses, papers, a conference and an exam. Soucheray graduated from the University of Minnesota College of Veterinary Medicine in 2002. She received her bachelor’s degree in art and history and worked for the Minnesota Timberwolves as an administrative assistant in the sales and marketing department before deciding to go to veterinarian school. She had to take three years of undergraduate science classes before attending veterinarian school. She’s also the owner of two yellow Labs. Miniscalco always knew she wanted to work with animals. She received a bachelor’s degree in animal science and went on to receive a veterinarian technician degree. She has worked in the industry for 12 years. She and Soucheray worked together at a clinic previously. She’s like a nurse — she gives injections, draws blood and manages bookkeeping. She has a cat, a pug and a black Lab. Pet owners believe that their lives are enriched by owning a pet, but did you know even the Centers for Disease Control (CDC) suggests that having a pet is good for you? Pet ownership and companionship can prevent you from feeling lonely, give you more opportunities for socialization, and give you a sense of love and pride from taking such good care of your pet. In fact, just petting your dog or cat can immediately lower your stress level! Dr. Soucheray Receives Certification as Hospice and Palliative Care Veterinarian! We are proud to announce that Dr. Sandra Soucheray has recently received the esteemed title of being a Certified Hospice and Palliative Care Veterinarian! She achieved this through completing the vigorous and specialized Animal Hospice and Palliative Care Certification Program. Dr. Soucheray is committed to adhering to the values and philosophies set by the International Association for Animal Hospice and Palliative Care, and she looks forward to providing her patients with the highest quality of care and compassion.